What Are the Real Benefits of Aloe Juice? 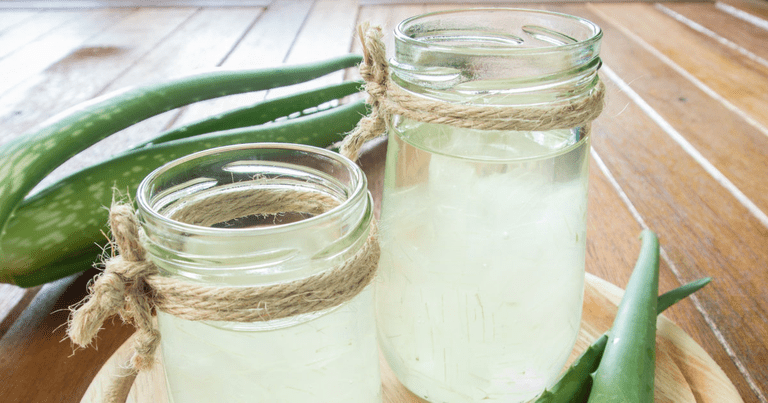 Others have proposed that drinking aloe juice may boost the immune system, improve skin and hair quality, increase muscle strength, relieve pain, and offer detoxifying effects. But what does the research actually tell us? Is aloe juice the cure-all some have suggested, or is there a downside we have yet to face? As of this moment, most of the claims about the benefits of aloe juice remain untested and are largely anecdotal. However, there have been a number of investigations into the effect of aloe in stimulating the immune system. One of the more publicized studies, published in the Journal of Agricultural and Food Chemistry, reported that a type of carbohydrate found in aloe juice, known as aloeride, appears to increase the activity of NF-kappa B (NF-kB), a protein complex central to the immune response. On the face of things, it's an interesting, and even promising piece, of research. However, it does have its limitations in what it actually tells. While the incorrect regulation of NF-kB is linked to everything from autoimmune disorders to cancer, it would be unreasonable to suggest that drinking a glass of aloe juice would have any effect on NF-kB levels, particularly since the active ingredient, aloeride, comprises only 0.015 percent of the crude juice. Moreover, it is unclear whether the aloeride concentration used in the test tube study could even be replicated in humans and what effect that might have on the body. At the moment, we're not even entirely sure if drinking aloe juice on a regular basis is such a good idea. While aloe juice is being seen on more and more grocery store shelves, many of the substances contained in the juice (aloe-emodin, aloin, and aloe latex) have a powerful laxative effect and are considered toxic when ingested in excess. So, while these substances (classified as anthraquinones) may be effective in treating constipation, most experts will advise against their use since they have the potential to cause gastrointestinal toxicity (manifesting with diarrhea and abdominal cramping). That's not to say that the news is all bad. Studies have shown that aloe may, in fact, help lower blood glucose levels in diabetics. However, those benefits may again be undermined by the adverse effects of the juice itself. Studies into the long-term consumption of aloe juice have shown that it causes the gradual depletion of potassium (central to muscle control) and can significantly reduce intestinal wall function over time. Drinking a glass of aloe juice every now and then is unlikely to cause you harm. Many people, in fact, have no adverse reaction to aloe juice, extracts, or capsule supplements. But it's important to remember that the purported benefits of aloe juice or any other oral aloe product are just that: purported. Until there is further evidence supporting the claims, it may be best to stick to things that are known to modulate your immune health, like a balanced diet rich in fresh fruits and vegetables, whole grains, lean proteins, and healthy unsaturated fats. Guo, X. and Mei, N. "Aloe vera: A review of toxicity and adverse clinical effects." J Environ Sci Heal. 2016; 34(2):77-96. Sahu, P.; Giri, D.; Singh, R. et al. "Therapeutic and Medicinal Uses of Aloe Vera: A Review." Pharmacol Pharm. 2013; 4:599-610.